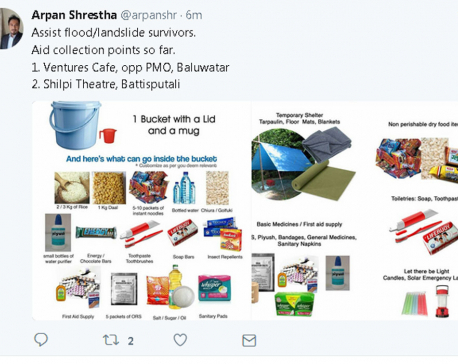 KATHMANDU, July 29: Citizens, organizations and groups are jumping in to help the floods and landslides affected people in various parts of the country. Various social organizations, non-governmental organizations (NGOs) and individuals are collecting relief materials for the flood and landslide victims as a humanitarian effort. HELP NEPAL Network, a charity network, has started collecting and distributing the relief materials in Saptari, one of the most affected district. “We have prepared family relief packs and have already distributed them to about 200 households,” Arun Singh Basnet, chairman of the organization, told Republica. The organization has a target of providing relief package to 450 households. “We provide sleeping blankets, mattresses and nets, clothes, cooking utensils and a tent as a family pack,” Basnet said. 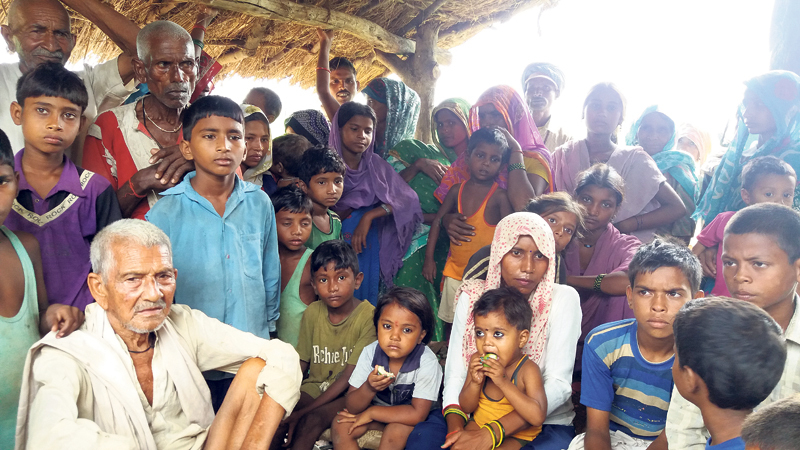 “We are distributing it among families who have very weak financial condition.” HELP NEPAL Network has been coordinating with some local organizations and local administrators in Saptari. According to the Basnet, HELP NEPAL Network has used its emergency funds to support the relief project and additional relief materials are also being sent by next week. Similarly, the organization has planned to send a team of doctors for free medical check-ups in eastern region. Other organizations and groups have also come together to collect relief materials for floods and earthquake victims. “It is a part of humanitarian effort to help the victims,” said Subhash Adhikari, an entrepreneur who has initiated collecting relief with the help of a group of friends. “Realizing the fact that many victims in Sunsari and Pyuthan have not received relief materials, we are gathering essentials such as food, clothes, water and medicines for them,” he said. A team of individuals including Adhikari have been working in collaboration with Nepal Red Cross Society and District Administration Office (DAO) Kathmandu. Adhikari said in the first phase, they are planning to distribute emergency relief materials starting from the next week in Sunsari and Pyuthan. Adhikari and his team have been using social media and personal contacts as tools for collecting relief materials. Nepal Red Cross Society has also been working in the relief project. It has started working on providing relief materials to the victims of landslides and floods across the country. Dibya Raj Poudel, head of the communication department at the NRCS, said that Nepal is not yet prepared for the disasters. “Disasters happen like almost every year and the people are the ones to suffer the most,” Poudel said.